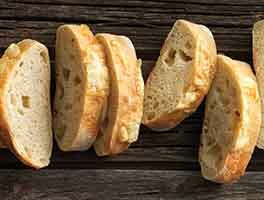 Italy's light-textured ciabatta bread, with its overnight starter and long rises, develops wonderful flavor. Translated to rolls, ciabatta becomes the perfect vehicle for an overstuffed sandwich. Sturdy enough to hold any filling, these flat rolls — they fit beautifully in the toaster — are mostly crust, meaning you don't have a lot of bread competing with the cheese, meat, and veggies. 12 hrs 33 mins. to 18 hrs 45 mins. Place all of the dough ingredients, including the starter, into the bowl of your mixer, and beat at medium speed, using the flat beater, for 7 minutes. The dough will be very smooth, soft, shiny, and elastic. Alternatively, knead the dough ingredients in your bread machine using the dough cycle. Transfer the dough to a greased bowl or other rising container, cover it, and let it rise for 2 hours. 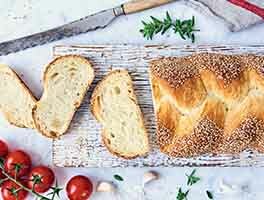 Give the dough a fold: Turn it out onto a floured surface and, using a bowl scraper or bench knife, fold it like a business letter. Turn the dough 90 degrees. Gently flatten it a bit, and repeat the letter fold. Return the dough to the bowl, cover, and let it rise for another hour. Note: If you're using a bread machine, simply allow it to rise for an additional hour after the dough cycle has ended; there's no need to take it out and give it a fold. Lightly grease your work surface, and two half-sheet baking pans (18" x 13") or similar large baking sheets. Grease your hands, as well. Pat the dough into an 8" x 10" rectangle and cut it into 12 squares (about 2 1/2" each). Transfer the rolls to the baking sheets, leaving about 3" between them. Lightly cover the rolls with heavily oiled plastic wrap or a proof cover, and allow them to rise for 2 to 3 hours, or until they're showing some signs of puffiness. Towards the end of the rising time, preheat the oven to 425°F. 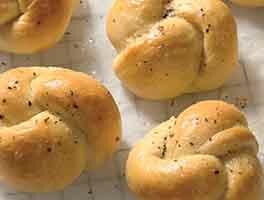 Spritz the risen rolls with lukewarm water, and gently but firmly dimple each one with your fingers, making fairly deep pockets. Note: For extra-crusty crust, forgo spritzing the rolls with water and instead add steam to your oven; for details see "tips," below. Immediately place the rolls into the oven. Bake them until they're golden brown, about 18 to 20 minutes. Remove them from the oven, and cool on a rack. Slice crosswise, and add your favorite fillings. Store any leftovers, tightly wrapped, at room temperature. Rolls may be reheated just before serving, if desired; tent lightly with foil, and heat for about 8 minutes in a 350°F oven. This recipe makes larger, sandwich-type rolls. For smaller dinner rolls, divide the dough into 16 to 20 pieces. 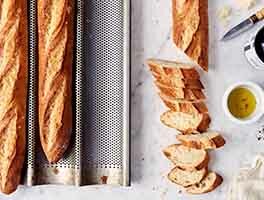 I use this basic recipe because it has a lower hydration percentage than most yet gives me the best of both worlds, a French-type bread with a crust that doesn't tear my gums! and a creamy crumb full of big holes. I have made several adjustments (hence the lack of a fifth star) but the one I want to promote right now is how I store and reheat the rolls. (1) I freeze the rolls or loaves - yes this makes great loaves too - as soon as they are completely cooled. (2) To reheat, I place my roll in the cold oven and turn it to 400 degrees. I set the timer for 8 to 10 minutes. 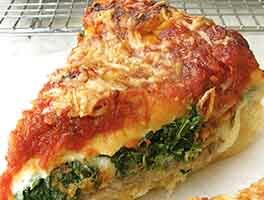 This results in a beautiful crisp crust that retains its thinness. This works for all breads, by the way. (3) Cool until you can split it without damaging the crumb, if you're in a hurry, or leave to cool completely. 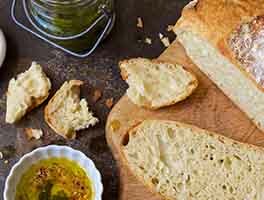 I wrote my first review of this recipe on 6/6/18, after baking these ciabatta rolls for the first time. Since then, I've made a batch nearly every week, with consistently outstanding results. I still weigh in grams, but I'm experimenting a bit now. I substitute 100g of KAF's Organic White Whole Wheat Flour for about 100g KAF Organic All-Purpose Flour. Sometimes I substitute some of my active sourdough starter for some of the starter in the recipe. (My starter is equal weight water and flour, so it's easy to calculate this substitution.) I think both of these substitutions add a subtle complexity to the final product. I have discovered a little trick for poking the holes on the top: I butter the end of a wooden spoon and poke the holes with that, rather than with my fingers. It's easier for me to get consistently sized holes that way. (Hey, I like "pretty", what can I say? We think these ciabatta rolls are the perfect bread for sandwiches. The size and flavor are great, and they don't fall apart, like some softer breads will. It's not unusual for guests to remark that these are the best ciabatta rolls they've ever tasted. Some ask for the recipe. Others are not bakers and ask me to bake a batch of these rolls for them! Bottom line: We think this recipe is a winner! Thanks again, KAF! Yikes, i broke my diet for these... Absolutely delicious and easy in every way. Next time I will use sourdough starter, discard. Outstanding! These are delicious ciabatta rolls! I followed the recipe exactly as written, using KAF ingredients, and weighing in grams. I was rewarded with ciabatta rolls that turned out exactly as the recipe described, with a great crust and delicious crumb. They cooled just in time for us to make Italian sandwiches for our dinner tonight, and we're looking forward to breakfast sandwiches tomorrow morning. These yummy ciabatta won't last long, at our house! Thanks to well-tested KAF recipes and KAF's quality ingredients I've learned how incredible home-baked goods can be. The flavor and quality far outshine anything one can buy at the store, or even at a bakery -- and so much less expensive, too! Another winner, KAF! Thank you! I decided to overcome my fears and experiment with bread baking. I don't know why I chose this recipe, other than I'd gone out to lunch the day before and had a wonderful sandwich on a ciabatta roll. These turned out really good! So far, I ate one fresh from the oven with lime curd on it. I ate one plain, after it had cooled. I ate one with my chicken soup last night. I'm sure this week, I'll be able to use the remainder for sandwiches. Great rolls but also great pizza. Only 2 of us so wanted to do 6 rolls. I refrigerated the other half of the dough and made a pizza with it. Cooked it on parchment on a stone at 425. Baked for 3 minutes then added the topping and cooked for another 12 minutes or so. It was great.